Nothing causes lawyers more sleepless nights than fear of missed deadlines. Just one ill-timed lapse can let a statute of limitations run out or a filing deadline pass. For that reason, tools that help you calculate and calendar deadlines are invaluable. One such tool is LawToolBox.com. It claims to have been the first online, rule-based deadline calculator, and it backs up that claim with a patent it applied for in 1999. However, until relatively recently, the Denver-based company kept a low national profile, in part because it was gathering the various court rule sets that would allow it to offer its product nationally. Currently, its rule sets cover all state and federal trial courts and some appellate courts. 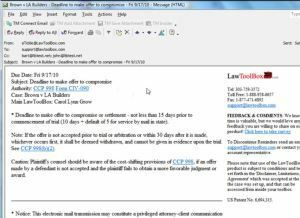 LawToolBox integrates with Outlook (click for larger view). LawToolBox also integrates with LexisNexis Time Matters and with Google Calendar. But the majority of the company’s customers — primarily litigators in firms ranging in size from solo to large — use the Outlook integration. LawToolBox integrates with Outlook using add-in software called Integrated Deadlines. The initial set-up of a case is always done online through the company’s website. 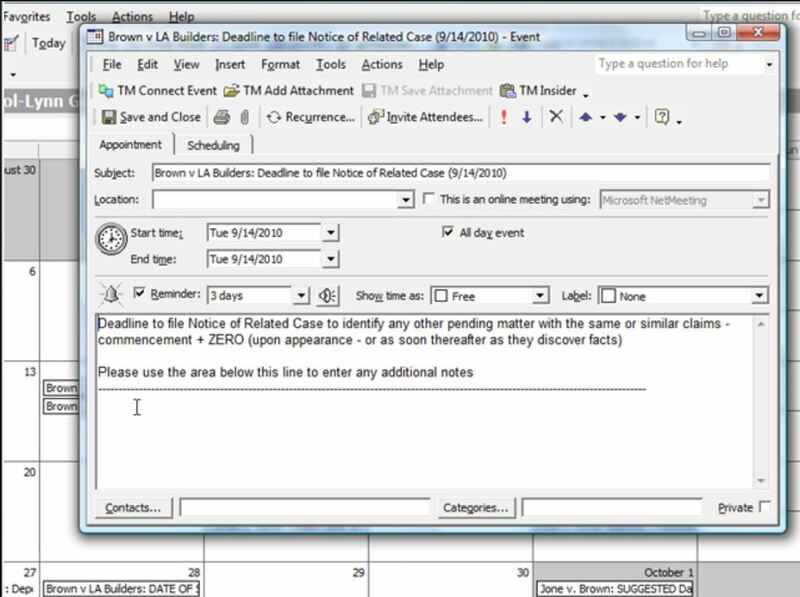 Set up requires someone — a lawyer or paralegal — to enter the basic case information, select the venue, and enter a trigger event, such as the date the complaint was served or the date the trial begins. Emails remind you of deadlines (click for larger view). Once the trigger is set, LawToolBox calculates all the deadlines and generates a detailed deadline chart that shows each deadline as well as the authority on which it is based. This chart can be downloaded and saved to your desktop. For users who opt for Outlook integration, the deadlines are automatically added to their Outlook calendars. Users can set options for how these are displayed. Deadlines can show as all-day events in your calendar, as tasks on your task list, or both. Specific scheduled events, such as depositions and court appearances, can be scheduled as appointments. Users can also customize when and how event reminders appear within Outlook. In addition to calendaring deadlines, LawToolBox sends email reminders. Many of these reminders include brief practice tips about the particular deadline and links to the applicable rule. Here again, you can choose whether or not to receive these email reminders. Note that the integration is one way only. Changes to deadlines cannot be made within Outlook, but must be entered through the website. Create your own deadline templates. If your firm has developed its own deadline template for specific types of cases, these can be important into and used within LawToolBox. Share cases. You can designate which attorneys and support staff in your office have access to a case. Each user is able to individually customize preferences for integration and reminders. 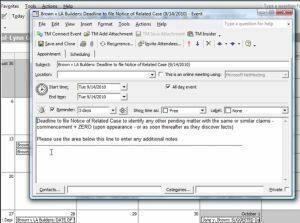 If a user is removed from a case, all synchronized events are removed from the user’s calendar. Transfer cases. If an attorney leaves the firm, the case deadlines can be transferred to another attorney within the firm. Alternatively, the departing attorney can take the case to the new firm, without paying another set-up fee. Deadline customization. Deadlines can be calculated and customized to match the specific requirements of a case. Thus, if a court enters an order modifying or setting deadlines, LawToolBox can make the necessary calculations and changes. Reports of deadlines. Various custom reports are available, showing deadlines for the firm, a case, an attorney or a paralegal. Typically, LawToolBox generates and emails a deadline summary report every Friday, covering the following week or month. History tracking. LawToolBox maintains a history of your activity, showing who created or modified a deadline and when it was done. The company offers free support for the first 30 days, after which support calls are free for the first 10 minutes and then charged at $95 an hour. It provides a set of free video tutorials that cover most aspects of its use. Unlike many cloud-based services, which are priced on a subscription basis, LawToolBox charges by the case. 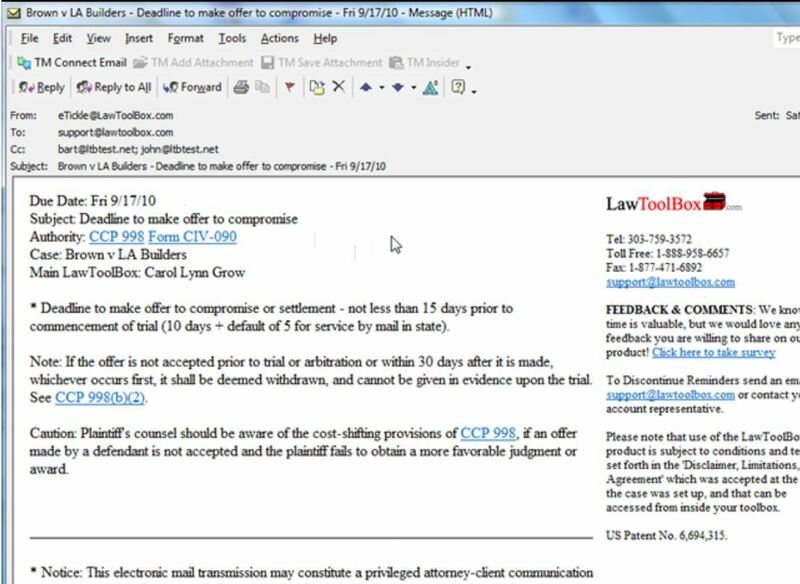 LawToolBox gives new customers a price quote that may vary in its details. Typically, however, a firm will pay a discounted rate of $49.50 per case for the first three weeks, after which the per-case cost becomes $69. In addition, to use the add-on that enables synchronization with Outlook, there is a per-user monthly charge that ranges from $10 for a single user to $3 for 26 or more users. If a firm uses its own custom rule set, then the price is reduced to $17.50 per case. This per-case pricing offers two benefits. One is that it allows the firm to pass the cost through to the client, so that the firm actually pays nothing for the service. The other is that it makes the service portable; if you move to another firm, you do not pay a second time to set up the cases you take with you. One other note on pricing: If you settle or close the case within 60 days of setting it up, the fee is refunded. For lawyers who are involved in litigation, a deadline calculator does more than help you sleep at night. It also helps you avoid malpractice and, in many cases, save on the cost of your malpractice premium. There are various calendaring products out there; some I’ve covered include JuraLaw, DocketLaw, and Deadlines.com (formerly Deadlines on Demand). With its per-case pricing, cloud accessibility, and tight integration with Outlook, LawToolBox is worth investigating. The company offers a free trial or you can view some of its video tutorials to get a better sense of how it works.